Old Stone Press was founded by John Clark in 2012. John Clark owned and operated a custom manufacturing and commercial printing company for 27 years. Midland Communications Packaging, Inc. was a national award–winning innovator in the presentation-packaging field. Midland designed, printed, and built custom loose-leaf ring binders, high-impact point-of-purchase retail packaging, and presentation packaging for business and industry. Along with his partners, he introduced print on demand (POD) to the Louisville, Kentucky regional marketplace in the mid-1990s and served as a a beta site for the then-innovative Indigo E-Print full-color digital printing technology now owned and marketed by Hewlett-Packard. He also holds the patent rights to the ChoroGrip product lines that are highly sought after in the loose-leaf sheet music and choral music industry. For more information visit: ChoroGrip.biz. Midland was sold in March of 2006 so John could pursue other interests and explore the book publishing industry. After publishing the award-winning coffee-table book, History in the Making: The Story of the American Printing House for the Blind in 2008 through the late Bill Butler and Butler Books, he launched Old Stone Press to meet the needs of author-publishers like himself who needed help navigating the often overwhelming wilderness of the self-publishing and book packaging industry. John’s civic work includes being involved with many nonprofit and for-profit boards in the Louisville area, including the Center for Nonprofit Excellence, Louisville Visual Art Association (LVAA), and the new Kentucky School of Art at Spalding University and Bourbon Baroque—Louisville’s Period Instrument Ensemble. He is a member of Leadership Louisville and is a Bingham Fellow. He also was a long-time board member of the Binding Industries of America (BIA) and served as its President in 2001-02. The BIA is now an affiliate of The Printing Industries of America (PIA), headquartered outside of Pittsburgh, PA with offices in Washington, DC. John is a graduate of the University of New Mexico with a BA in Fine Arts. He and his wife Gretchen live in Louisville, Kentucky. 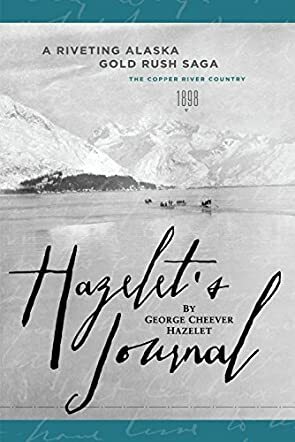 Hazelet's Journal: A Riveting Alaska Gold Rush Saga is more than the adventure of one man; it is the adventure of a nation seeking something bigger and more than themselves, of people who were willing and able to try to make a new path. The editor of the actual journals, John H. Clark, is the great-grandson of George Cheever Hazelet. He made minimal edits, and the ones he did were to make it better for people to understand. These journals tell of forest fires, floods, gun fights, and back breaking work to move forward. There is also the beauty of nature and the determination of those who kept pushing themselves, mentally and physically. There are pictures throughout the book, which help readers understand the hardships of the people who went before to get us where we are today. George Cheever Hazelet became a tycoon at the dawn of the industrial age with the help of the chicory-coffee market. When the bottom fell out because the markets crashed, George turned his sights to the Klondike Gold Rush of the 1890s. He was well aware of how dangerous and uncertain this trip would be, but there was no other choice; he had a family to feed and care for. He decided to write a daily journal about everything he did and saw, people he met, people he saw die, and it helped him get through the hardships he faced at every turn. The Cooper River Country was known as the last frontier and George was determined he was going to be the one who tamed it. George became a respected business and civic leader in Alaska, met several US presidents, was a driving force in the development of Valdez and Cordova, and became the first mayor of Cordova in 1909. I thoroughly enjoyed this book. Normally I am not a fan of non-fiction, but this book hooked me in from the the first sentence. It was enjoyable because as you read the corresponding pictures came alive and I was there with George and his crew, experiencing all the pain, joy, sadness, and happiness they endured. I would love to see a documentary on this expedition. I highly recommend Hazelet's Journal to everyone who likes real live adventures and who enjoys history and the beauty of nature.